I am humbled by the wisdom of my body and inspired by its patience, by its willingness to put up with all that I do wrong, by the fact it never stops trying to heal me. It supports me and brings me life. It knows what works and what doesn’t. Yet until I got clean and embraced all natural, whole foods – I could not FEEL it. I am getting better and better at tuning in. Today I was supposed to complete a spreadsheet, create the outline for a contract, and reorganize my kitchen table full of notes to myself about all the ongoing projects. I did none of that. I cooked. I did not warm up stuff. I cooked. I let my soul lead. I got a little crazy – three skillets. Three different kinds of oils. Hijiki (Someday, when I travel to Japan, I am going to harvest some of this mineral-rich sea vegetable myself). I had to soak it before I could use it. I did not rinse it quickly, but soaked it in spring water, filtered spring water. It all started with rummaging around in the kitchen while my tea water heated. Matcha tea from Japan – ceremonial grade. The word ceremonial pulled me in – “Ceremony: an honoring.” The start of a beautiful weekend at home deserved just that. 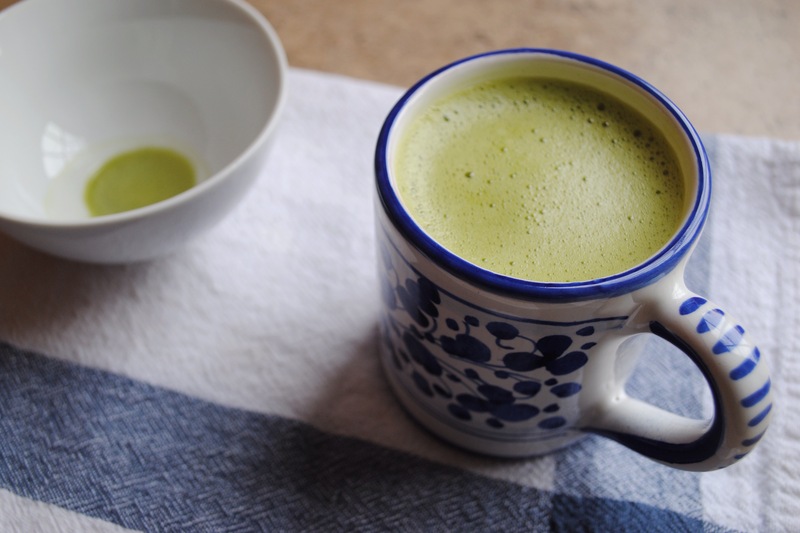 I settled into the moment – glass bowl, bamboo scoop, matcha powder (brilliantly green), filtered water heated to perfection, bamboo whisk (whisking in gratitude, lifting up love), a froth – slowly forming on the surface – remarkable, gentle. This becomes the first gift to my system. Warm, vibrant, healing. I sip, two hands cupped around the bowl, as if in prayer. That is how it started. A whole day of culinary creation simply flew by, happy and whole. Later, after a beautiful meal of fresh vegetables, plant proteins and sea vegetables, my whole being is content and at peace. I am aware that my core is deeply satisfied. My gastrointestinal tract is not disturbed – it seems to be humming. The thought of adding anything is unpalatable. I frequently ‘need just a little bite of something ….’ to stop the searching, or craving. Tonight if it was handed to me, I would easily and happily say, ‘Oh, no thank you.” Crazy right? This is what I call balance. This is the state in which nourishing my body correctly allows it to stay aligned with my core vibration – remember the ‘humming’? The energy of the food itself was balanced – so I stayed in balance. Nothing too dense, or too light; nothing too baked down or whipped up; nothing but clean whole food. My body teaches me. It affirms what my mind believes to be true. It responds clearly and simply. When we clean up our system of processed, fast, microwaved, packaged ways of eating – ‘picking up’ something on the run, eating while doing six other distracting things – standing, or meeting or emailing – this is the basis for healing. Wow, I get tired just writing about how silly we get. This is healing. This is in harmony with the innate healing wisdom of my body. Oh yes, as a medical doctor who has been studying, reading, attending, and processing – I am trying to use all that I have learned. It is when I get the chance to live fully that I celebrate. I know truth when I experience it. I am excited for the opportunity to give back and share all that I have learned – about food, stress, diseases, and relationships, with others – and with yourself. Health and healing. I am making great progress on that journey. Join me, it’s going to be fun.